From a young age, Jane Valentin had a passion for the beauty of terroir and the intricacies of individual winemaking styles. After studying at UC Davis and getting her Master’s at Sonoma State University, she developed her repertoire for big, carefully crafted wines at Hall Wines. 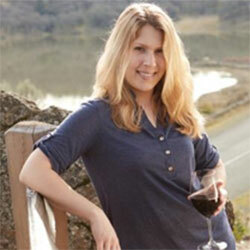 The experience led her to Guenoc Valley, where she hand-crafted a collection of artisanal wines. Wanting to return to Napa Valley, she found her way to Beringer Vineyards in St. Helena where she is currently serving as Assistant Winemaker to the Stags’ Leap Winery and Beringer brands, as well as Winemaker for other luxury Napa Valley brands. Her goal is to showcase the extensive possibilities of traditional varietals, and to make wine that is lush with rich complexity and opulent tannins.